Deadpool 2 is everything the first one was, and more. The violence is even more ridiculously over the top, the profanity so ramped up that even Colossus drops an f-bomb, and the emotional core of the story remains as believable as ever. I laughed. I cried. I laughed and cried at the same time. And I didn’t even have a spike through my head. Of course Ryan Reynolds is back as our loveable hero, as is Morena Baccarin as his one true love, Vanessa. Brianna Hildebrand returns as Negasonic Teenage Warhead, Stefan Kapacic as Colossus, Leslie Uggams as Blind Al, Karan Soni as Dopinder, and T.J. Miller as Weasel. Joining the party are Josh Brolin (fresh off killing half the universe) as the responsible, world-weary Cable, Zazie Beetz as the super-confident Domino (who’s mutant power is handled with great, casual good cheer), and Julian Dennison as the damaged and dangerous Russell. And in a stroke of inspired hiring, David Leitch (of John Wick and Atomic Blonde) is onboard to direct the mayhem. 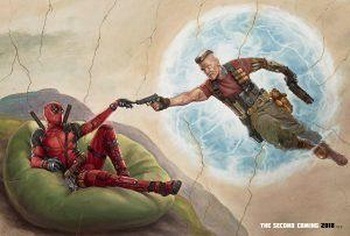 Deadpool 2 begins not long after the first film ends, with Wade getting in touch with his maternal side. But that is only the set up. After a horrible personal tragedy sets things in motion, Deadpool embarks on a heartwarming journey to protect Russell, a dangerous fourteen-year-old mutant. But it’s complicated, because Cable shows up to prevent his own horrible personal tragedy by killing the kid before things go too far. And because that’s not complicated enough, protecting Russell soon involves Deadpool and Weasel assembling a crack team of mutants, dubbed X-Force, so Deadpool can develop as a human being and show his warm, nurturing side. And also kill large numbers of bad guys and blow up lots of cars, trucks, and buildings. Bill Skarsgård shows up as Zeitgeist, Terry Crews as Bedlam, Lewis Tan as Shatterstar, Brad Pitt as Vanisher, and Rob Delaney as Peter. They briefly round out the X-Force before the team becomes more…streamlined. There are already three decapitations before the opening titles roll. Shatterstar has green blood. Lots of it. Dopinder aspires to be Kirsten Dunst to Deadpool’s Tom Cruise in the worst Interview With the Vampire analogy possible. Now we all know what a “prison wallet” is, whether we wanted to or not. As Wade promised Blind Al in the first Deadpool, the cure for blindness is indeed next to the stash of cocaine. I think the “when does this happen” question gets answered pretty clearly in the X-Mansion. 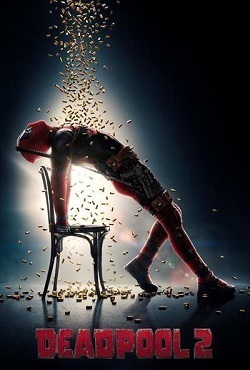 Deadpool 2 references too many other Marvel superheroes to keep track of, takes more than a few swipes at DC, turns Yentl’s ballad “Papa” into a recurring theme, and in a scene so disturbingly funny I will refer to it only as “the legs”, resurrects Basic Instinct in the most disgusting way imaginable. Deadpool 2 repeats a couple of tricks from the first film with enough of a twist to keep them from being simply trite. It is familiar without being a retread, and while it doesn’t really break any new ground (after the first, how could it without scratching at NC-17? ), it manages to be just as remarkable. And in true Marvel fashion, it proclaims loudly that zealotry is bad, family is where you find it, death is temporary, and time travel fixes everything. Let’s face it: Deadpool 2 is the hero we deserve.